Belle Époque is a seaside residence with elite apartments of the highest premium class. It occupies the last vacant plot with water-front location, set meters away from a sandy beach on the picturesque peninsula adjacent to the rocky Cape Ambelits near Lozenets resort, the area being called "The Bulgarian St. Tropez". 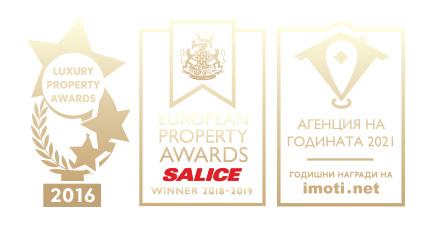 Belle Époque Beach Residence is designed by one the most successful and sought after Bulgarian team of architects in the recent years. This unique residence was inspired by the atmosphere of the Côte d'Azur in France and is designed in the architectural style of the world famous resorts of St. Tropez, Nice and Cannes. The seaside residence Belle Époque Ambelits Beach comes with classic architectural style with many ornaments on the facade, fences and wrought iron railings, landscaped area with dozens of species of plants. It consists of two buildings of four floors: building Belle Époque Residence with a total floor area of 2300 sq.m and 45 apartments, divided into 3 sections. There is a choice of luxury apartments - studios, one- and two bedroom apartments, two level apartments (maisonettes) and unique penthouses on the top floors. The apartments are between 36 sq.m and 120 sq.m. Thanks to their flexible layout, the standard apartments could go through various kinds of reconstruction and compilation of two or more apartments. Тhe ground floor apartments come with unique private garden-terraces. All owners and their guests can enjoy breathtaking sea views in all directions and from all apartments. • Full range of services for the residents of the complex - property management, security service and maintenance of the apartments, as well as a wide range of housing and communal services. • Seaside residence, designed to be iconic! Perfect in every detail! Real premium class property! • Excellent concept for the building facilities and services, designed specifically for customers with high social status. • Unique location on the last vacant plot of land, with absolute waterfront position adjacent to the sandy beach and dunes of the picturesque peninsula of Cape Ambelits, next to one of the most prestigious spots along the Bulgarian Black Sea - Lozenets. • Residence of elite homes, not an apartment hotel! In order to ensure peace, quietness and perfect relaxation to the apartments owners, short–term rental to tourists on hotel-basis is not allowed! Long-term rentals for minimum 30 overnights is welcome and fully supported by our sister companies providing full rental service and management. • Special area of sandy beach reserved for owners of apartments in the Belle Époque. • Low-rise apartments building with a gross floor area of just 2300 sq.m, comprising only 35 apartments and 2 two-level penthouses (maisonettes) with huge terraces. • Choice of high-class apartments - studios, one- and two bedroom apartments and two level apartments (maisonettes), unique penthouses on the top floors. • Architecture and interior design by one of the most famous Bulgarian architectural studio. • Several types of standard packages for luxury furniture of different styles. • Opportunity for special completion and furnishing according to an individual interior design, which fully complies with the requirements of the buyer. • Apartments with private garden terrace on the ground floor. • Highly reputable developer with over 12 years experience and many completed luxury projects. • Organization of the internal and external security in the complex - security guard, common areas and parking. • Support and assistance to the owners in order to ensure undisturbed usage of their homes and the complex as a whole. • Organization of the payments associated with the common parts - payment of the electricity, water, common areas bills. The apartments in Belle Йpoque Ambelits Beach are offered for sale completed and with fully equipped bathrooms with all accessories. The apartments will be ready for use. There are several types of standard packages for luxury furniture of different styles. There is a possibility for special completion and furnishing according an individual interior design that fully complies with the requirements of the buyer. We can offer quality furniture at affordable prices, depending on the client’s taste. The company can designed quality furniture packages for the different types of apartments that include everything that one might need for living and for renting. The basic packages include standard furniture made of laminated chipboard. There are also packages with optimized cost, achieved through clear vision of the furniture and the lack of extras and accessories, but without compromising with the quality of the materials used. In the basic concept of the building is focused on the 1- and 2-bedrom apartments which can be merged into larger apartments, according to the needs and desires of the buyer. At the same time each apartment is so large to be itself enough for its residents for usage as a holiday home or an apartment for permanent living. The apartments do not have unnecessary large spaces that increase the price of the property or complicate their maintenance. The residential area of the apartments is designed to provide maximum living comfort consistent with the ergonomic requirements of the specific functions of the living room, the kitchen, the bathroom, etc. At the same time the space is so optimally dimensioned that allows equipping and furnishing of the apartments with all the standard furniture, household appliances, facilities and decoration, as well as to offer enough comfort to their inhabitants. • smooth Wienerberger plastered brick walls, painted with white paint. No gypsum plasterboards will be used! • fitted bathroom accessories - mirror, shelf below the mirror. • possibility to install a landline telephone as well as connection to cable TV and the Internet. • any other internal finishing works as per the buyer’s wishes - such as underfloor heating, fireplace, various types of decorative plastering, etc. Orders can be sent till August 2014. For execution of more difficult tasks related to an individual design and completion of the property, we will require to be provided with a preliminary prepared complete engineering and design project by a competent architect or interior designer, preferably a specialist whom we have been working with. Sizes of premises shown in the architectural plans are pointed out in centimeters and measure the distance from wall to wall in regard to the brickwork without considering plastering above the bricks. According to the Bulgarian State Standard, the thickness of plastering layer on brick wall is allowed up to 3 cm. Therefore, in order to calculate the exact distance between the walls and the size of the apartment it needs to be deducted up to 3 cm of the distance to each wall. Company Chobanov and Stoyanov Ltd. makes every effort to maintain the high standard and quality of the work. In this connection, the standard of plastering layer made by our company is up to 1.5 cm, which guarantees the maximum possible size of the premises. However, the honoured customers to be aware of that in many cases need a variation in the thickness of the plaster to allowed 3 cm, despite our desire to minimize. The seaside residence Belle Epoque Ambelits Beach comes with classic architectural style with many ornaments on the facade, fences and wrought iron railings, landscaped area with dozens of species of plants. It consists of one building of four floors, with a total floor area of 2236 sq.m and only 36 apartments, divided into 3 sections. All apartments have high ceilings at 3.05 m construction height. Standard height of residential buildings in Bulgaria is approx. 20–25 cm less. In the living rooms of the mesonettes C 301 and C 302 the ceilings are 4.30 m high. There is a choice of elite apartments - studios, one- and two bedroom apartments, two level apartments (maisonettes) and unique penthouses on the top floors. The apartments are between 34 sq.m and 141 sq.m. Thanks to their flexible layout, the standard apartments could go through various kinds of reconstruction and compilation of two or more apartments. Тhe ground floor apartments come with private garden terrace. All owners and their guests can enjoy breathtaking sea views in all directions and from all apartments. Belle Йpoque Ambelits Beach is a seaside residence with waterfront location, set meters away from a sandy beach on the picturesque peninsula adjacent to the rocky Cape Ambelits near Lozenets resort, the area being called "The Bulgarian St. Tropez". The area is a favorite vacation spot for the Bulgarian intellectuals, successful business people and managers, as well as people from the art circles. Cape Ambelits resort near Lozenets enjoys a quiet, pleasant and relaxed atmosphere that is suitable for a real vacation with family and friends. The beach is wide and beautiful golden sand, the sea water is warm and clean and the summer days are hot and long. The area has great opportunities for water sports, several very good schools for surfing and kite-surfing, options for renting a jet or catamaran. Cape Ambelits and Lozenets are famous for the high concentration of fine restaurants and trendy bars with a friendly party atmosphere. Located about 60 km south of Bourgas Cape Ambelits next to Lozenets resort is easily and quickly accessible by asphalt road and from there takes about 40 minutes by car. Sozopol is situated 25 km away and Sunny Beach is 100 km away. Bourgas International Airport, which serves the area, is located 65 km away. Varna International Airport is located 220 km distance. The architecture was influenced by the unique elegance and enjoyment of life, characteristic of the late 18th and early 19th century. "Belle Epoque" or "the beautiful era" was a period known for the flourishing of the arts, filled with beauty and carefree exuberance, leaving us with nostalgia for this wonderful utopian harmony. This spirit has inspired the creation of this wonderful place for living and vacation, away from the dynamic life of modern times. Each ornament of the building, every little detail contributes to the harmony of the facade. The lavish moldings, gracefully curved railings and the pearl whiteness combined with the lush greenery transfer the residents in that lost paradise "Beautiful Age", which combines romance and glamor, luxury and lightness, elegance and beauty. The construction of the Belle Epoque Beach Residence complex started as planned in January 2014. The construction was completed and Certificate for Habitation was received in August 2016. As of today the complex is fully operational. The sales prices of the apartments at Belle Йpoque Ambelits Beach are calculated according to the high status of the complex, its unique location, luxury and high quality of the materials and the completion work. Each apartment can be the booked immediately with a non-refundable deposit of 2000 Euros payable in cash, by credit card or bank transfer. The deposit will be reserved for the period up to the signing of the preliminary contract - within 15 days. Upon negotiation with the Buyer, according to his/her proposal. Please contact the responsible agent for this project to discuss all options for payment.